One of the things I love about the official Mediterranean diet pyramid is the little glass of red wine pictured on the side next to the glass of water. Wine in moderation, red wine in particular, is considered an inherent part of the Mediterranean diet. Plenty of research links moderate wine consumption to general health benefits. Whether the wine itself is responsible, or is just a marker for a healthy lifestyle -- such as the Mediterranean one -- is open to debate. Red wine is known to contain a variety of antioxidants that may have health benefits. As a result, many people are drinking more red wine. Along with antioxidants, red wine has calories, from alcohol and carbohydrates. If you're counting calories for weight control you need to account for those in wine. 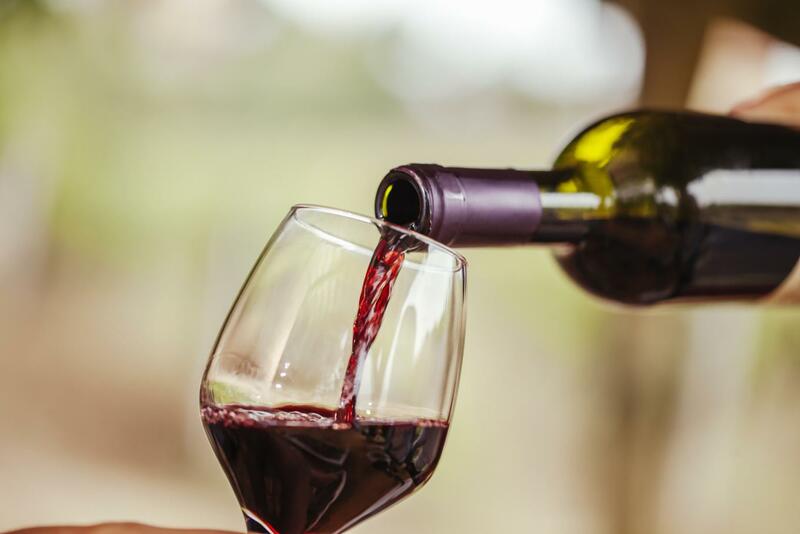 According to the USDA nutrient database, different varieties of red wine tend to have very similar calorie counts, although not all the calories come from alcohol. A 5 fluid oz glass of red wine has an average of 122 calories and just over 100 of those calories are from alcohol (about 14 grams). The rest of the calories are from carbohydrates. Aside from antioxidants, red wine doesn't have significant amounts of any other nutrients, such as protein, vitamins or minerals. Alcohol is metabolized differently from carbohydrates and fat. The alcohol molecule is metabolized to acetate which is used as an energy source. One result is that the metabolism of fatty acids for energy can be reduced if there's a lot of alcohol in your system. This would not be desirable for people who are trying to control weight. It's another good argument for drinking red wine in moderation, whatever the health benefits. For older adults, particularly women, alcohol itself can be a problem. Our ability to metabolize the ethanol molecule diminishes as we age, so ethanol hangs around longer in our blood stream, affecting cognitive and neuromuscular function. Alcohol is also dehydrating. Again, two more good arguments for moderation. But there's that fuzzy feel-good term "moderation". What exactly does it mean in the real world? As I noted in my book "Food Wisdom for Women", when it comes to alcohol consumption, the definition of "moderation" is all over the map. In general, organizations like the Centers for Disease Control stick to the One Drink Per Day definition, which is included in the US Dietary Guidelines. Then of course we have to define "drink." For wine, it's typically 5 fluid ounces (just over 1/2 cup), which approximates what you would be served in a wine glass at a restaurant. Maybe. For a standard wine glass, you might expect to get a glass that's just over half-full. But if the glass is the size of a soup bowl, you'll be getting a lot more than 5 fluid ounces, even if it's only half full. And if you're pouring wine at home and you top off the glass, you're pouring more than 5 fluid oz, which means more than the average 122 calories. One easy way to get a handle on this is to get out your different sized wine glasses, measure 5 fluid ounces of water, pour it in the different glasses and note how full the glasses are. This will also help you to judge how much you're getting at a restaurant or a friend's home. Or, you could measure out 147 grams - that is the average weight of a 5 fluid ounce glass of red wine. Whatever the health benefits might be, the Mediterranean diet does not advocate excessive red wine intake. Remember, the Mediterranean pyramid features just one glass of wine. A few years ago, a study of the health benefits of this diet concluded that 7 glasses of red wine a week was ideal, which is one glass/day (NOTE: drinking all 7 glasses on one day = Bad Idea). How do you add red wine and still control calories? Well, if you're already drinking a glass of red wine as part of your typical daily fare, and your diet is going well, you've figured that out. Then, if you're pouring your own glass at home, I'd measure my wine glasses (as above) to be sure you're not pouring more than you think. Once you've got a handle on portion size, I'd look for ways to trade off calories in other foods or beverages that aren't that healthful. For example, red wine calories can be swapped for foods you may be using as treats: a cookie, a doughnut, a scoop of ice cream, a small candy or energy bar, or sweetener and whipped topping on your latte. Another strategy is to cut back slightly on portions of other foods across the board, especially at dinner: rice, noodles, salad (with dressing), casseroles, soup and bread are good candidates. Leave butter off of bread, vegetables and potatoes, or use less oil for frying. If you're trying to follow a more Mediterranean diet, one basic principle is smaller portions of meat/poultry/dairy and less processed meats. If you tend to eat large portions of high-fat meats, then cutting back can leave enough calories for a glass of red wine. Fortunately red wine isn't a huge source of calories, so these food swaps don't mean big changes in portions. You can enjoy a glass of red wine with your meals and not worry about extra calories impacting your weight control plan. Donna P Feldman MS RDN is author of Feed Your Vegetarian Teen and Food Wisdom for Women: nutrition for aging with energy, vitality and health. Donna writes about food and nutrition at Radio Nutrition and is co-host of the Walk Talk Nutrition podcast. Mediterranean Diets: Good Food, Good Fats, and Healthy Eating!